UPDATE 4: Quick update Saturday (22 JUN) from MOL. The fore and aft parts are drifting near 14”35N 64’50”E and 13’22”N 62’48”E respectively in an east-northeast direction. The weather at the site is still adverse and a patrol boat is expected to arrive at the site around June 24. 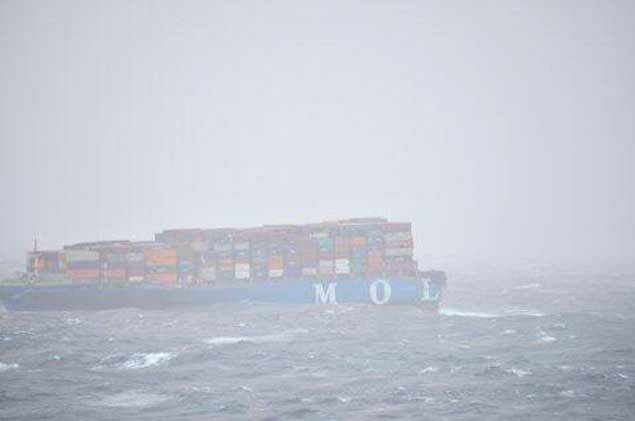 MOL says some of the containers might be lost or damaged, but majority of the cargo are confirmed to be aboard the fore and aft part. Also two tugboats are heading toward the site and are expected to arrive around June 24. MOL still confirms no large volume of oil leakage. UPDATE 3: Mitsui O.S.K Lines (MOL) notes today in a statement on their website that a salvage company has been formally contracted to perform the salvage of the two floating halves of the MOL Comfort. They didn’t specify which company, but information we’ve attained seems to point to SMIT. We’ve reached out to them this morning to confirm. In addition, crew members from the ill-fated vessel arrived in the port of Colombo, Sri Lanka today. Previous updates: On Wednesday, MOL notes that their investigation into the cause of the incident has commenced, in conjunction with the vessel’s shipbuilder, Mitsubishi Heavy Industries. Tugboats have been arranged to tow the two halves of the vessel and a patrol boat has been dispatched from Jebel Ali to monitor the scene until tugs arrive at a later date. The patrol boat is expected to arrive on location June 24, a later update from MOL said. At about 10:00 JST (05:00 local time) on June 19, 2013, the two fore and aft sections of the MOL Comfort, laden with containers, are drifting at about 2 knots near 12’57″N 61’10″E in an east-northeast direction. UPDATE 1 (18 JUN): The MRCC in Mumbai has tweeted saying that the sections are still afloat and are being monitored by the MV Sanderling Ace, another MOL managed vessel. MOL update from Tuesday, June 18, 2013. At about noon JST on Tuesday, June 18 (07:00 local time), the fore part of the hull is drifting around 13’00″N 60’40″E, and the aft part is about 19 miles southwest from that point. At present, both parts of the ship are laden with containers and drifting in an east-northeast direction. We are also arranging tugboats to tow both parts. gCaptain’s unofficial weather routing expert, Fred Pickhardt, has informed us that on Tuesday near the vessel, winds remained from the SW at about force 7 with waves of 5-6 meters. Red circle indicates MOL Comfort’s position reported on 18 JUN 2013 at 20:18:12 GMT, as well as its track since approximately Saturday. At the time of this update, the ship was drifting at .9 knots, down from 2.5 knots earlier Tuesday. Full vessel position report HERE. Satellite AIS data courtesy PortVision. Click image for larger. 26 crewmembers of an MOL containership were forced to abandon ship Monday off Yemen after the ship suffered from catastrophic hull failure and reportedly sank broke in two. The MV MOL Comfort, an 8,000 TEU-type containership cracked in half about 200 miles from the Yemeni coast at about 12’30″N 60’E while enroute from Singapore to Jeddah with a load of 7,041 TEUs. All 26 crew – made up 11 Russians, 1 Ukrainian and 14 Filipinos – escaped the sinking ship on two life rafts and a lifeboat. According to a report by IANS News, the Indian Coast Guard in Mumbai diverted three vessels in the area to assist. 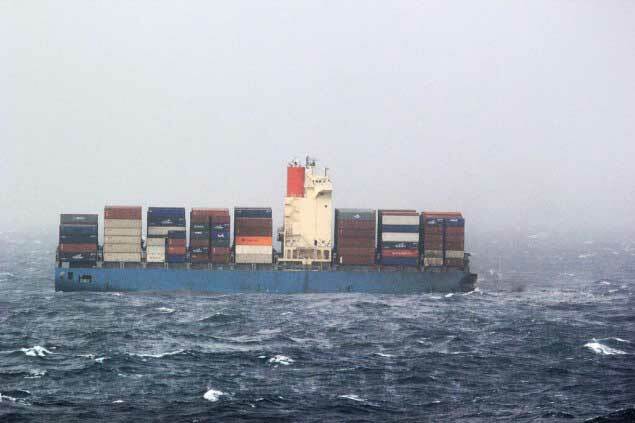 The MV Yantian Express was first to arrive on scene and rescued the survivors. 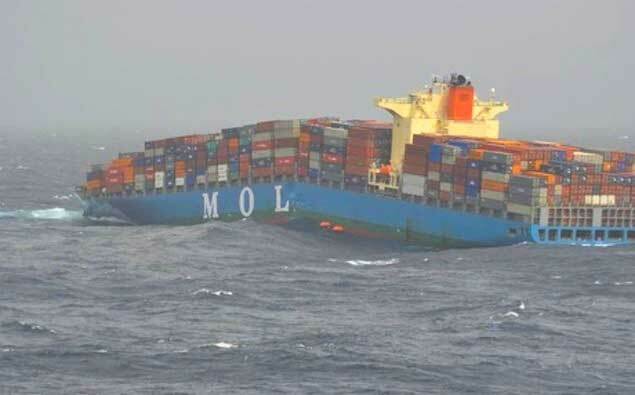 The 2008-built MOL Comfort sank a short time later, the report said. Weather at the time was strong winds and seas up to six meters. The ship’s operator, Mitsui O.S.K. Lines, says that an Emergency Control Headquarters has been established for the incident and MOL is taking company-wide measures to settle the matter. The MOL statement said that damage was “extensive” and that details of the incident were still being confirmed. From a naval architecture standpoint, this is a puzzling situation. Ships are designed to handle long period and large waves that crest on the bow and stern and have a trough amidships. This creates a sagging situation that puts extreme tension on the keel and compression at deck level. The opposite, “hogging” situation occurs when the crest of the wave moves to the center of the ship and the trough of the waves are at bow and stern. The repeat flexing of the ship in these perfectly timed waves is likely what caused the loss of this vessel. In the photo above, a perfect example of hogging is shown, where the bow and the stern are both lying in the troughs of two waves. The loading of the containers on board may have exacerbated the situation. Although the loading of the containers appears even in the photo, the weight distribution of the containers may not have been even. Had heavier containers been loaded on the bow and stern and lighter ones in the center of the ship, the vessel may have been placed in a hogging situation before she even set sail. It’s speculation of course to say one way or another, but assuming that she met class requirements, it’s one possible explanation for what happened.